But against all odds, Powers emerged from the wreckage and was seized by the KGB. He confessed to espionage charges, revealing to the world that Eisenhower had just lied to the American people--and to the Soviet Premier. Infuriated, Nikita Khrushchev slammed the door on a rare opening in Cold War relations. 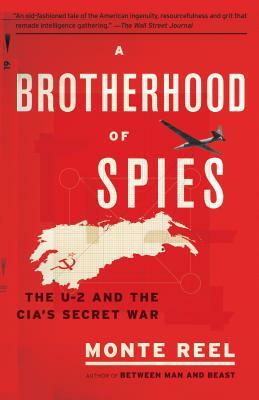 In A Brotherhood of Spies, award-winning journalist Monte Reel reveals how the U-2 spy program, principally devised by four men working in secret, upended the Cold War and carved a new mission for the CIA. This secret fraternity, made up of Edwin Land, best known as the inventor of instant photography and the head of Polaroid Corporation; Kelly Johnson, a hard-charging taskmaster from Lockheed; Richard Bissell, the secretive and ambitious spymaster; and ace Air Force flyer Powers, set out to replace yesterday's fallible human spies with tomorrow's undetectable eye in the sky. Their clandestine successes and all-too-public failures make this brilliantly reported account a true-life thriller with the highest stakes and tragic repercussions. MONTE REEL is the author of two previous books, Between Man and Beast and The Last of the Tribe. His writing has appeared in The New Yorker, The New York Times Magazine, Harper's, and other magazines. He currently writes for Bloomberg Businessweek as part of its Projects & Investigations staff, and previously was a foreign correspondent for The Washington Post. He lives in Illinois. "A gripping work of narrative nonfiction . . . This exemplary work provides a wholly satisfying take on a central chapter of the Cold War—a dramatic story of zeal and adventure." "Captivating . . . A richly detailed, well-researched, and engagingly written book that takes us behind the scenesof one of the twentieth-century's most nail-bitingly tense episodes."